This page contains thrifty, do it yourself, wall decor projects and tips. 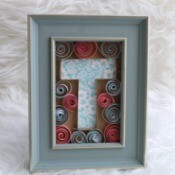 Monogram Initial Picture Frame ArtI made this monogram initial picture frame for friend who is expecting. I thought it would be a nice simple pre-Mother's Day gift. This technique can be used for party accents, weddings, and home decor. Making a Mural from BeansI was cleaning out my pantry and found tons of really old bags of dried beans with very little left in them. Even though they were dated, and some rather dusty, they looked pretty in their natural colours, side by side. I decided to turn them into this mural for my kitchen. 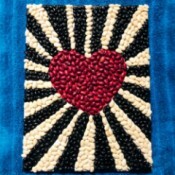 To make this, you just need some paints that are close in colour to your beans. 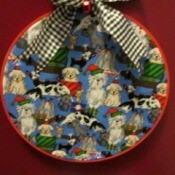 Embroidery Hoop Pet ArtI wanted to do something for our pet (Tyler). Often we decorate our home for different holidays, this time and for now on, we will include Tyler's corner, with a little art of his own! This can be made with very little and can be interchangeable with different fabric pieces and it is washable. Bragging Rights! 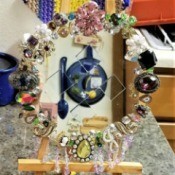 Second Place State FairI won 2nd place for my embellished mirror at the State Fair for Oregon/2018!